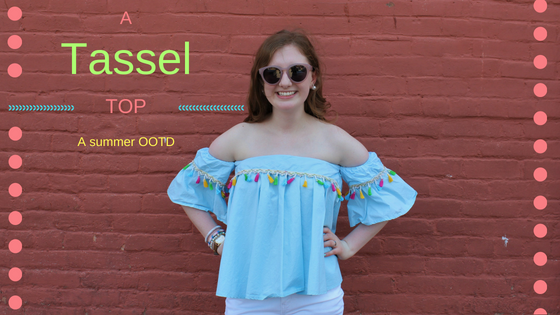 Tassels are one of my favorite summer trends! I recently shared about some festive tassel earrings and today I wanted to share about this tassel top that is a must-have for your summer wardrobe! I featured this top in my summer clothing haul video and this my first time actually wearing it and I love it. This outfit is so fun and perfect for a day of shopping. I paired this tassel top with my favorite white jeans from Old Navy and my classic Jack Rogers sandals which are my favorite sandals for spring and summer. My purse is from Belk and it is my favorite purse for traveling and being on the go. Its a nice size and hold a good amount of items but it isn't too bulking. I also like that the brown leather goes with most of my outfits so I don't have to worry about that while traveling. The three tassels on the purse add a fun pop and a bit of color to it as well. I kept the jewelry simple and only wore bracelets because the top is a statement in its self but I think a Kendra Scott Elisa necklace would have looked cute paired with this top too. Isn't it cute, I thought it was perfect for summer! Thank you for the comment!